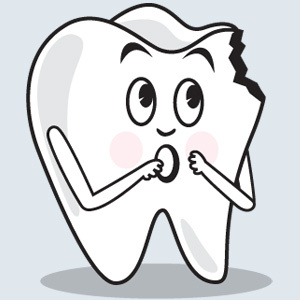 Having a chipped tooth certainly can make life more difficult. It not only keeps you from wanting to smile, but it may also make it harder to eat your favorite foods. And that can be a major problem — especially if you need to eat up to 80 pounds of bamboo every day to stay healthy. Just ask Bai Yun, the female giant panda at the San Diego Zoo. The 23-year-old animal recently chipped one of her lower canines, and her keepers were concerned that it might impair her ability to get good nutrition (pandas spend as many as 12 hours a day munching on the woody plants). So they decided it was time for a little dental work! What followed was not unlike a regular visit to the dental office… except that, instead of sitting in a chair, the 227-pound panda reclined on a large table. After being anesthetized, the patient’s teeth were examined, and x-rays were taken. A composite resin was applied to the damaged tooth, and it was cured with a special light. After the repair work was done, her teeth were given a professional cleaning. When the anesthesia wore off, Bai Yun was released in good health — and ready to eat more bamboo. Tooth bonding with composite resin is the restoration of choice in many situations. This method can be used to repair small chips or cracks in the teeth, and to clear up some spacing irregularities. The resin itself is a mixture of tough, translucent plastic and glass components that can be made in a number of different shades, which look remarkably like the tooth’s natural enamel coating. And the bonding material links up so well with the tooth structure that this treatment can be expected to last for years. Another benefit of bonding is that it can be done right in the office — there’s no lab work involved (as there could be for veneers or crowns, for example). That makes it a relatively simple and economical treatment that can typically be completed in a single visit. It’s ideal for fixing minor flaws that don’t involve a great deal of tooth structure. It’s also a cost-effective solution for teenagers who need cosmetic dental work, but must wait until they have stopped growing to get more permanent restorations. While it isn’t usually as long-lasting as restorations like crowns and veneers, cosmetic bonding is a minimally invasive, reversible treatment that can keep your smile healthy and bright for years to come. And that’s important — whether or not you spend most of your day eating bamboo and posing for snapshots at the zoo.